To make the brine, in a large bowl, combine the water, vinegar, brown sugar, thyme, juniper berries, red pepper flakes, salt and black pepper. Stir until the sugar and salt dissolve. Place the pork chops in a large sealable plastic bag and pour in the brine. Seal the bag closed, squish the brine around the chops and refrigerate overnight. At least 30 minutes before you plan to begin grilling, remove the chops from the refrigerator. Discard the brine, rinse the chops briefly in cold water and pat dry with paper towels. Prepare a charcoal or gas grill for indirect grilling over medium heat; the temperature inside the grill should be 350° to 375°F. If using charcoal, bank the lit coals on either side of the grill bed, leaving a strip in the center without heat, and place a drip pan in the center. If using gas, preheat the burners, then turn off 1 or more of the burners to create a cooler zone. Brush and oil the grill grate. 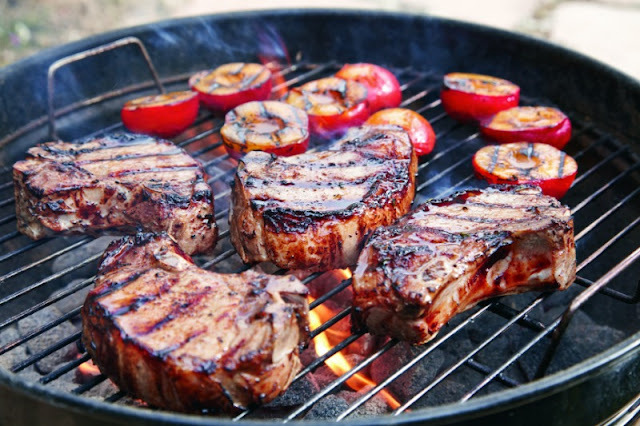 Place the pork chops on the grill over the direct-heat area and sear, turning once, until nicely grill-marked on both sides, 2 to 3 minutes per side. Move the chops to the indirect-heat area and cover the grill. Cook until the chops are somewhat firm to the touch or until an instant-read thermometer inserted horizontally into the center of a chop, away from the bone, registers 145°F, about 15 minutes more for medium. Transfer the chops to a platter and let rest for 10 minutes. Meanwhile, brush both sides of the fruit halves with oil. Place the fruit over the direct-heat area and cook, turning once, until nicely grill-marked, about 2 minutes per side. Serve the pork chops immediately with the grilled fruit on the side. Serves 6.